A six-cent sheet stamp paid the special air mail rate for contractors and civilian employees using Army or Navy post offices, effective October 23, 1942 through September 30, 1946. In this case the APO was 394, located in Italy. The sender was associated with UNRRA, the United Nations Relief and Rehabilitation Agency created on November 9, 1943 to assist in repatriating refugees in Europe. 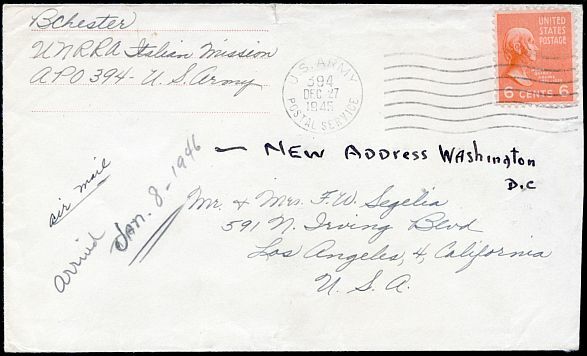 In 1945, the year this cover was sent, it handled millions of cases and managed hundreds of displaced persons camps in Germany, Italy and Austria.